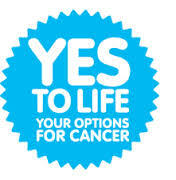 YES TO LIFE is a charity that supports people with cancer in the UK in taking an integrative approach to their treatment. Integrative Medicine is a broad approach that combines the best of Complementary & Alternative Medicine with standard treatments, to widen choice, extend care and improve results. We feel that the mental state of a person with cancer is a foundational aspect of any treatment programme. It is vital that anyone feeling they are a 'victim of cancer' begin to take control of their situation as early as possible, that they make informed decisions about treatments and that they take ownership of whatever path they choose.